The Healthy Shakes™ diet provides structure and convenience through the use of HMR® Shakes, five or more servings of vegetables and fruits daily along with one healthy meal of your choice. 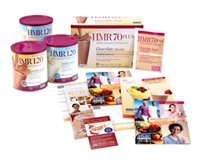 Our premier diet kit for maximum weight loss. All the food and materials you need for 3 weeks of weight loss. Just add fruit and vegetables.